Short, Sweet and inexpensive wedding ceremonies for cost conscious lovers. 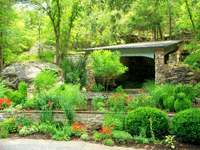 If your dream wedding is small, simple and located outdoors in the natural beauty of Eureka Springs and you prefer to spend your budget on a honeymoon or down payment on your first home together, rather than an expensive wedding, then any of the Nature Weddings is the answer. $50 for the simplest outdoor to $129 (plus required 2 night minimum stay) either indoors or outside at an award winning Bed and Breakfast Inn. The maximum number of guest that can be accommodated is 6 and that includes babies, kids and adults. To keep the folks back home happy who weren't at the wedding, we can suggest including them in a reception, lunch, dinner, picnic or barbeque at a later date when you return from your honeymoon, plus sharing your wedding photos with them. If you feel you are being pressured by well meaning friends and family who might be getting a little too involved in your plans and turning it into something you really didn't want, escape to your dream in Eureka Springs. 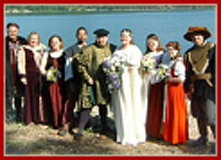 We specialize in short, sweet, and inexpensive weddings for cost conscious lovers and we love elopements. There is no dress code. Come as you are; jeans, shorts, suits, bridal gowns or tux, whatever pleases you. Motorcycle weddings at any of the $50 locations are always welcome. Weddings and commitment ceremonies are by reservation as we travel to the different locations, but we do strive to be ready on a moment's notice for last minute simple ceremonies whenever possible. Obtaining a marriage license at our local courthouse downtown in the Victorian part of town couldn't be simpler. Bride and groom both need to have a valid photo driver's license ID or a passport to prove you are both at least 18 years old, just know your social security numbers and $60 in cash. The clerk will ask all the questions, fill out the application and you should have your marriage license within 5 minutes. No witnesses, blood tests or waiting period. Please call All About Love toll free at 1-888-568-3020 or locally 479-253-2526 to schedule that small, intimate, simple wedding in the prettiest natural setting for lovers. We'll be glad to answer questions and refer you to lodging, restaurants, shops, and attractions to further relieve you of stress. Copyright . All About Love. All rights reserved.